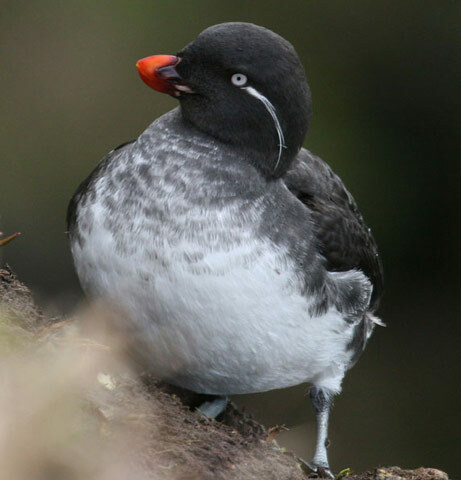 Parakeet Auklet: Breeds on Bering Sea islands and nearby coasts; spends winters offshore as far south as California. The Parakeet Auklet used to be placed on its own in the genus Cyclorrhynchus but recent morphological and genetic evidence suggest it should be placed in the genus Aethia. It is named because of its unusually shaped bill, which is almost round like that of a parrot. This unique bill shape helps them to feed on their favorite foods of slimy jellyfish and zooplankton. It makes a series of rhythimc hoarse calls and a quavering squeal. Their function is unknown, but could be associated with defending its burrow from intruders and strengthening the bond with its mate. 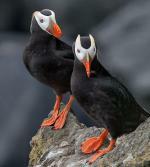 The Parakeet Auklet has a wide range estimated at 100,000 to 1,000,000 square kilometers. This bird can be found in Canada, the United States, Japan and the Russian Federation. 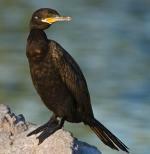 It is a marine bird with a preference for ocean and fresh water locations and shoreline, coastal and cliff habitats. The global population of this bird is estimated to be around 800,000 individual birds. It is not believed that the population trends for this species will soon approach the minimum levels that could suggest a potential decline in population. Due to this, population trends for the Parakeet Auklet have a present evaluation level of Least Concern.